West End is a row of Victorian houses located in Long Preston, Yorkshire, built in the 19th century. Located on the outskirts of the Yorkshire Dales National Park, the West End properties sit parallel to the busy A65. Previously wooden fences were used along the front elevation of the properties to act as a perimeter between the houses and the grass verge adjacent to the road, but they were now rotten and unsightly. Three of the homeowners had joined forces to invest in replacement railings. Having decided that metal railings would alleviate the arduous task of having to repaint wooden fencing and hopefully improve the look and value of their properties, an internet search for ideas on suitable replacement railings led to the Alpha Rail website. 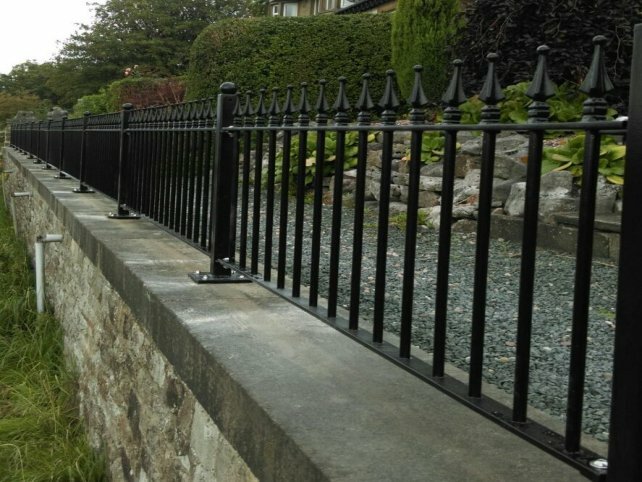 Having listened to their brief to supply an attractive, low maintenance road side perimeter for the front of Victorian era houses, Alpha Rail was asked to provide a solution that would retain the aesthetics of the location and era whilst providing a safe barrier from the A65. The residents originally chose a basic flat top railing design, but following discussions with Alpha Rail we went on to supply 30 metres of decorative vertical bar metal railings. 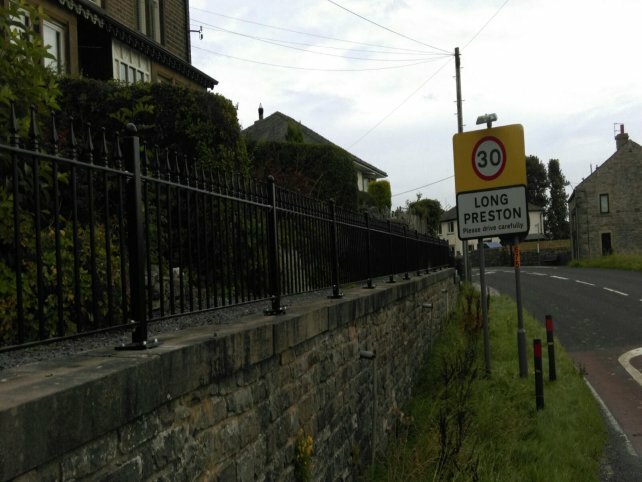 These were manufactured to a bespoke height in order to ensure the railings maintained the right sense of perspective for passing motorists. Having seen the final drawings, the residents decided that the square centre posts lacked something. Further discussions with Alpha Rail led to the addition of round ball finial which finished off the design perfectly. The posts were mounted on square base plates that were fixed using chemical anchors in to the coping stones that topped the stone wall. The addition of a decorative finial featuring a spearhead provides the ideal finishing touch. The railings were galvanized and polyester power coated black RAL 9005 In order to ensure low maintenance and protection from the elements. ""Everyone at Alpha Rail was incredibly patient and helpful. Even though this was a domestic project, nobody was dismissive and were totally understanding of our needs. The railings are of a very high quality and the installers were meticulous in ensuring the metal railings looked perfect with a smooth flowing level fence line.”"